This collection of Flower Essences was made by Elizabeth Sheehan as she walked the ancient pilgrimage route across northern Spain known as the Road to Santiago de Compostela or the Camino, which in Spanish means â€˜the Wayâ€™. 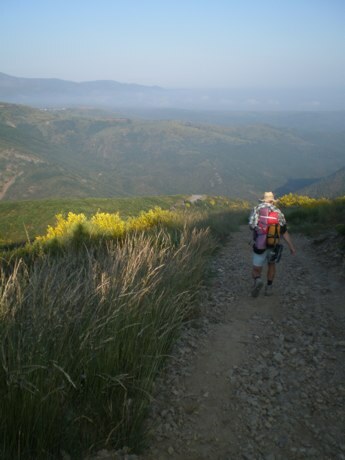 The five hundred mile Camino offers the pilgrim a course in healing. Located on powerful ley lines, the land of the trail is very high in vibration and holds significant divine purpose. In addition, millions of pilgrims have walked the trail with a single-minded focus on their spiritual lives. This has cleared the trail of much ego static and imbued it with the spiritual wisdom the untold pilgrims learned on their journeys.Elizabeth made 19 Flowers Essence mixes on the Camino. After returning to Green Hope Farm, she spent time with each Flower Essence mix, seeking to understand its energetic gifts. She discovered that the healing intention of each Essence dovetailed with what had happened to her at that place on the trail. 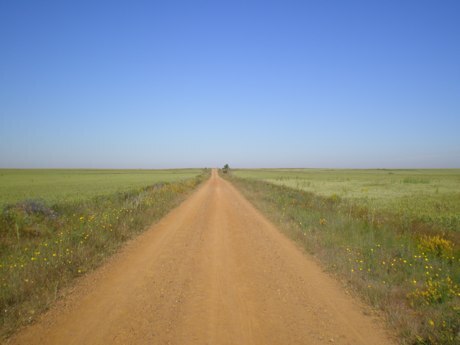 This reflects the nature of the Camino as a very specific course in healing, with different places on the Camino acting as classrooms for different spiritual challenges. To walk the Camino is to step into a healing groove carve by divinity and to partake in a divinely orchestrated healing journey. In her definitions, Elizabeth shares both the universal gifts of the Essences as well as a description of what she was learning at that point in her journey. I thank her for bringing us these wonderful Flower Essences and making it possible for those of us who havenâ€™t walked the Camino to partake of its healing gifts. And now, I turn this document over to pilgrim Elizabeth. 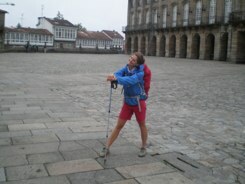 For well over a thousand years pilgrims from all over the world have walked the Camino. Because medieval pilgrims began their pilgrimages at their front doors, trails to Santiago begin in places all over Northern Europe. 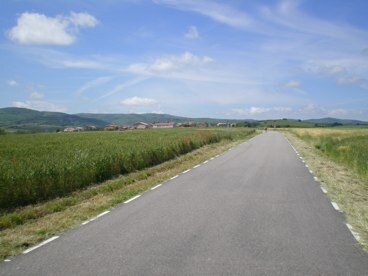 At the French and Spanish border, many trails converge into one five hundred mile trail across northern Spain that is known as the Camino Frances. This spot of convergence is the small town of St. Jean Pied de Port in the foothills of the French Pyranees. From there, the pilgrim route goes over the mountains and across northern Spain to one of two places. 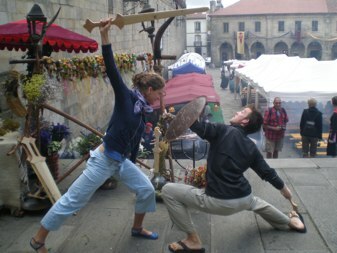 The Galician city of Santiago de Compostela is the traditional ending for Christians while the seacoast peninsula of Fisterra was the traditional ending place for Celtic and other pre-Christian pilgrims. Santiago de Compostela translates as St. James of the Field of the Stars. The name refers to the Christian disciple St. James. 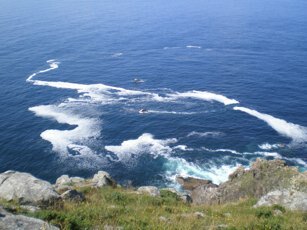 The story is told that after James was beheaded by Herod, his remains were put in a stone boat that floated across the Mediterranean to come ashore near Fisterra. The story does not end there, for in the year 807 a shepherd is said to have found the remains of St. James in a field illuminated by a multitude of stars. At the spot where the remains of St James were found, a cathedral was built to house his bones. No one is certain that the bones belong to St. James, but his long association with the trail has forever linked him to this pilgrim route. 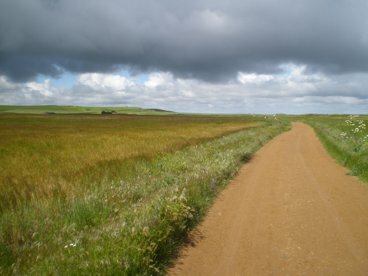 During the middle ages, the Camino was considered one of three major pilgrimages that a Christian could walk to atone for sins, to thank God for blessings, or to ask for divine intercession. The first two routes were to the more remote destinations of Rome and Jerusalem. This meant the third pilgrim route to Santiago de Compostela was the most affordable, accessible, and therefore vastly more popular pilgrim route with literally millions of pilgrims walking this trail during the middle ages. 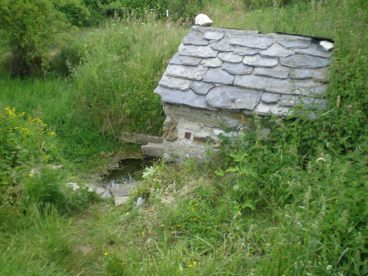 Many of the hostels along the route have been giving shelter to pilgrims for over a thousand years.As noted, the tradition of walking this route is older than the discovery of St Jamesâ€™ remains. For the souls waking the trail in Celtic times, the end of the trail was 100 km beyond Santiago de Compostela at a seaside promontory of Fisterra. Before the discovery of the western continents, this spot on the coast was thought to be the end of the world, hence the name Fisterra, which roughly translated means â€œend of the land.â€ Fisterra, where the land falls away and the ocean goes out into the unknown, has been a place long associated with ideas of transition. On arrival at Fisterra, it is still a pilgrim tradition to burn something of significance that you have carried along the trail or to throw your walking stick into the ocean, thus signifying the completion of one part of oneâ€™s journey and a new beginning. 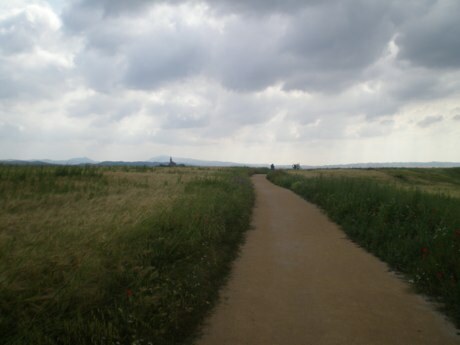 Pilgrims including St Francis of Assisi, Charlemagne and the Spanish monarchs, Isabel and Ferdinand, walked the Camino. The pilgrimage lies on land that has long been seen as sacred by many different groups of believers. Part of its strength comes from how it aligns with the Milky Way constellations. This alignment reflects its spiritual purposes beyond the ownership of any one religious group. After falling into quiet times, the trail has seen a return of pilgrims in the last few decades. This reflects how the trail holds timeless spiritual gifts in its very ground, gifts offered with infinite generosity to the hearts of the more than one hundred thousand people that walk the trail every year. 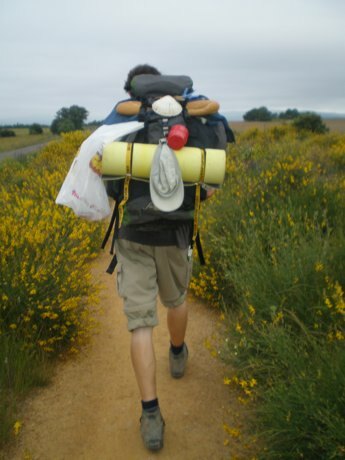 I set out on the trail in June of 2008 with little or no idea what awaited me along the way, and with little more than my slightly too heavy backpack and my own courage to guide me. I set off from St. Jean Pied de Port, one of the more popular starting places in southwestern France. Along the way, many Flowers called to me to be included in the Flower Essence mixes. All of the Flowers involved in the Essences were very clear about their purposes. Each of the Essence combinations is named after a place near where the specific Flowers were collected. 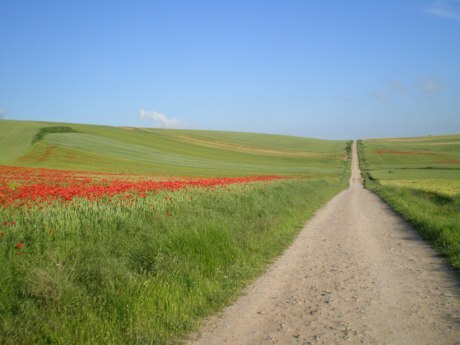 Each Flower Essence combination holds both a personal story for me as well as a universal healing dynamic.It is often said that the experience of walking the Camino is one of intensity. Everything is heightened. The major spiritual issues of your life journey are brought into focus to be seen and resolved. In an effort to make the dynamics crystal clear, the characters you meet, and the emotions you feel are sometimes larger than life. The journey reveals many things by bringing everything to the surface.This collection offers support to see our spiritual journeys with clarity. It offers ways to heal, release or move through specific dynamics each of us face on our journey through life. The collection is about the flow of the heroâ€™s journey. It is about the way in which our lives run in cycles of growth.The trail teaches many things, but one of the most important gifts that it bestowed upon me was that it helped me to be exactly where I was. These Essences, made throughout my journey, help us experience all the stages of the heroâ€™s journey, knowing that each stage, either beautiful or painful, will pass and a new landscape, a new moment of the journey will arrive. 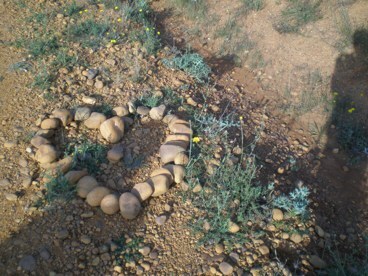 The trail has a history of being claimed by many different religions or groups. But the trail, its Flowers, and the Flower Essences in this collection are clear in their purpose to serve the light in each of us as individual souls. In doing so, the Flowers and these Essences help to heal some of the ancient wounds that have long been a part of the Camino. 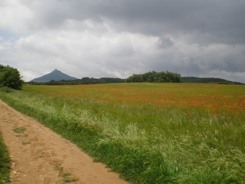 Each Essence is named after a place on the Camino. The definitions explain the spiritual dynamic of each place as I experienced it. Along with each of the Essence definitions, I wrote a short description about my personal experience on the trail during this stage in the journey. My hope is that sharing this will help explain the Essencesâ€™ gifts and helps us all heal and live our heroic journeys. I am healing at its deepest core. I am not a faÃ§ade of spirituality or religion. I am the oneness of land and spirit. I have come to share the ancient gifts of healing that this land can give to humans. I have long been covered in blood, shed by confused souls battling for the illusion of ownership of my pathway. I have lain dormant for many years as the battles raged on. I have come again in this modern age to guide souls back to their true journey on this Earth, a shared journey.The Flowers along my pathway hold an exponential amount of healing energy that will assist all that use them in being able to get down to their real work. I am the combination of the physical and spiritual planes as they come together to aid each soul in finding their way to healing. I am the grounded vision of the future, if humanity can do the work that they are being called to do. I am the reassurance that as each soul faces the inner journey, it is a gift to the light of the world and one that cannot be denied.The vibration of my pathways is swiftly rising. I must be clear that the work is more valuable now than ever before. I am the journey back to wholeness. I am a trail of light, the will serve the world through every soul it touches. I am the taste of what the planetâ€™s vibration will now need to become and a view into the intensity of the light in the ages to come. Being able to summon the strength to take the first step in a journey. Allows the body to access the reserve of energy needed for the initial change into new ways of being. 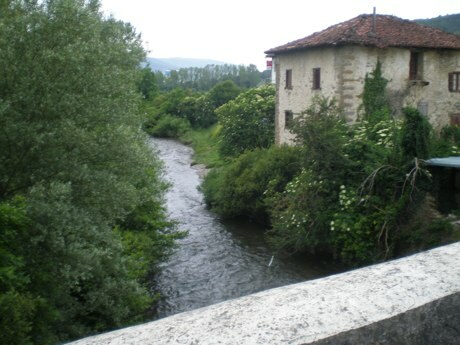 As I sat in the pilgrimâ€™s office in St. Jean Pied de Port, I wanted to begin my pilgrimage, but conventional wisdom suggested I had arrived at the starting point too late to do the first dayâ€™s 25km/15 mile walk up and over the Pyranees into Spain. Yet, I was very eager to start. Then again, part of me was unprepared to hike that day. I was wearing long pants and my bag was filled with extra food and stuff that I had planned to jettison before hitting the trail. But a group who had arrived on the train with me had decided to begin, so I quickly joined their pace and set off. 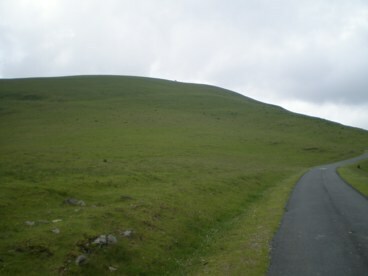 I needed reserves of physical energy that first day when I climbed up and through the mountains. And for that reason the Flowers that I collected on those open plains and lush mountaintops helped to fuel the first leg of my journey. When I got to the first nightâ€™s destination of Roncesvalles, I knew the trail had already given me the gift of the strength to begin. Allowing the momentum of you life to fuel its forward flow. Entering a state where expending energy on creative activities essential to your path creates energy rather than depletes your reserves. 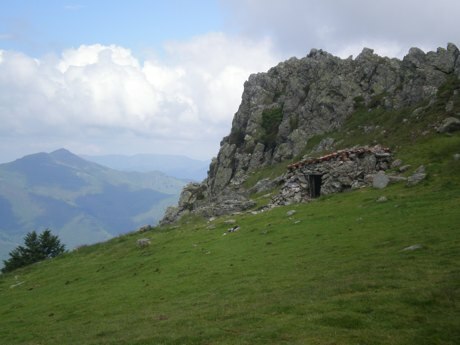 Zubiri was a place that I passed through on my second day of walking. 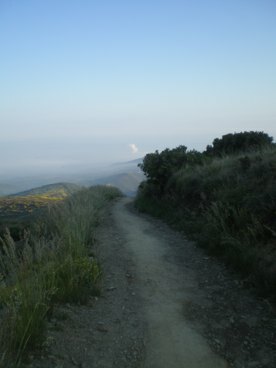 The trail wound down off the slopes of the Pyrenees and into the valleys below. The day was crisp and bright. The light, the land, and all the Flowers brought such joy to each step. I found that the forward arc of each of my feet, meeting the ground on the winding trail, recharged my body and spirit, much in the way that a hybrid car recharges itself as it drives. Trusting your lifeâ€™s pacing and standing by it with fully centered and grounded conviction. 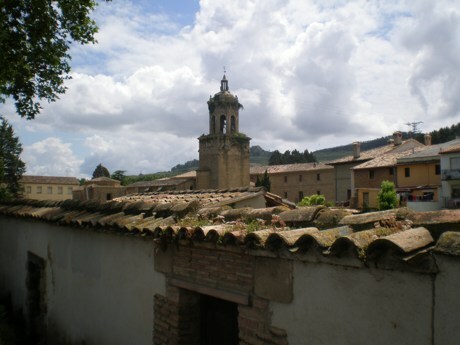 Albergues are the hostels just for pilgrims that line the route of the entire pilgrimage. Arre was a town with a beautiful albergue where I spent my second night. That day, I had walked over 40k/24 miles. I still felt the buzz of energy from the life force of the trail when I had an interaction that challenged me. I was sitting in a courtyard surrounded by ancient rose bushes and pilgrimsâ€™ laundry hanging out to dry when an Australian woman came and joined me. She was very chatty and told me and the other pilgrims I was sitting with her reasons for being on the trail. Then she asked me about my journey. As soon as I told her about where I had walked from and my excitement to move fast, she quickly opened up into a stream of disapproval. She told me that I was not listening to the trail and that my mode of walking was wrong. I was affronted, but knew that my wisdom about my own pace was in accord with my journey. We receive challenges like this from the universe all the time, those Angels in disguise that call us to stand in our truth, no matter what reasoning the outside world throws at us. Lightening your energetic load and being clear about whom you travel forward with. Learning discernment about who sees your worth and can actually support your growth. Puente la Reina is the city where I spent my third night on the trail. Previously I had walked with a man from Denmark who had been part of the original group that I started with on the first day. During this day of walking, I walked ahead when he needed to slow down due to his knees. 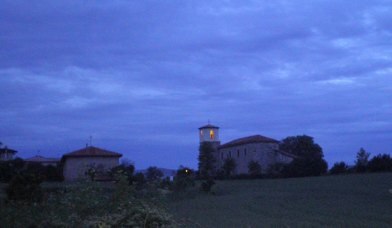 This departure happened on the outskirts of Pamplona, a city famous for the running of the bulls. This moment of moving ahead was one of clarity. It was a moment when I knew that I needed to keep moving forward and that there were other souls further ahead who could better support me in my journey. Because this man reminded me of a person with whom I hade recently parted, this felt like a big moment for me. That night in the albergue I met a charming German boy with whom I had much in common. Like myself, he had been a teacher. Like myself he was trying to figure out his life. I was encouraged by my first taste of being with young people. Before this moment, the trail had felt full of older people either on their own or in couples. That evening, before everyone disappeared off to bed, I asked the young man if he would like to walk with me the next day. He told me that would be ok if we woke up around the same time, our pace was the same, and it just happened. â€œYea sure, whatever.â€ he said. This was not the enthusiastic response I was hoping for. If he did not want to make the effort in the smallest way, then I needed to go on and seek people who would. The trail was teaching me discernment about my choices of traveling companions and my worthiness to travel with kindred spirits. In Puente la Reina, I also lightened my pack by leaving behind my heavy, but brand new sleeping mat. I left it with a gulp in the albergue, but did not miss its weight and bulk on my back for one minute. On the trail everything in oneâ€™s pack must be essential. Flushing out all the things that were not needed was a favorite pastime. I found the practice could be almost completely translated to the all the things we carry internally as well. Hence I set off before sunrise in the company of two Italians who spoke not a lick of English, in an effort to lighten all types of loads. Finding the bravery to move ahead on your own and at the same time being open to support from unusual places and activities. This was a particularly tough stretch of the trail for me. I was traveling with two souls that were very kind but spoke no English. This night we slept in a small town at the base of a beautiful mountain with ruins of a castle on top. The village was nearly deserted. The only life seemed to be the ice cream truck that rolled through town in the afternoon. The castle could be seen from miles off and when it came into view I had one of those experiences of recognition that is core deep, but often completely mysterious. The next morning brought me to another internal crossroads. One of the Italians had left before dawn and the other was having severe problems with his achilles tendon and the dreaded tendonitis, something I also was starting to feel. 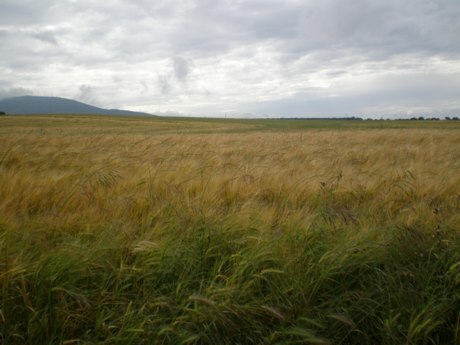 On the flat and empty plains, covered in nothing but grain as far as the eye could see, I set off walking totally on my own. I was solo for the first time on the trip. When I lost sight of my Italian friend behind me, I knew I was truly in the universeâ€™s hands. What that morning brought was the narrow and winding streets of Los Arcos, the most delicious cookies I have ever eaten in my life, as well as the company of an older German man who wanted to practice his English with me. He shared with me that his mother was named Elizabeth, just like me. These gifts though small, helped me to feel taken care of. I walked on with the growing awareness that the trail would support me along its length. Discovering your unique autonomy, cultivating your deep creative strengths, and then turning them into assets in obtaining the life you desire. This essence came from a beautiful and very proud region of La Rioja. 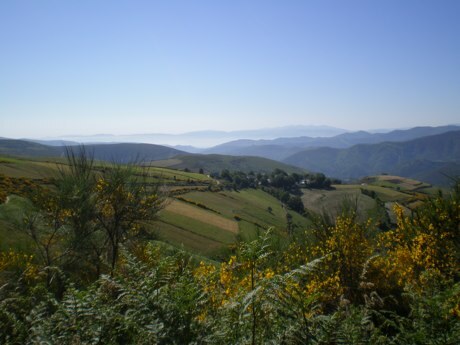 This small, but autonomous region is known around the world for its wines. Many hours were spent walking in rust red soil next to the fields where the grapes grew. 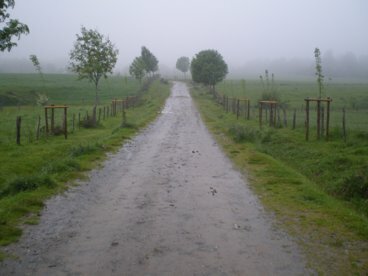 This summer happened to be one of the rainiest in Spanish history and the trail beside the vineyards was both breathtaking and crazy making, because the mud was thick, wet, and deep. It would cling to the soles of your shoes, and could topple your wobbly balance at any moment. I must admit I took a few not so graceful falls, but I blame it all on my pack. As I encountered clusters of people out in the fields and the occasional lone farmer, it became clear that the grapes were a source of life both economically and spiritually for the people of this region and for that reason the land vibrated with the energy of respect and gratitude. Holding faith in the emptiness before the dawning of the next chapter when you will find your authentic and supportive community. This dusty town was the place I slept after a particularly long and hot day. Much of the walking was along a dishearteningly ugly highway. 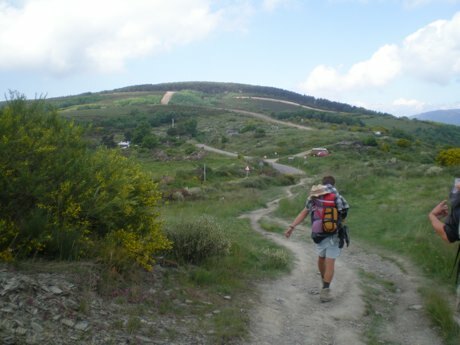 Since the Camino has been in existence for over a thousand years, itâ€™s route across the country is usually the most direct way to get from place to place. The modern Spanish government has not been blind to this fact. 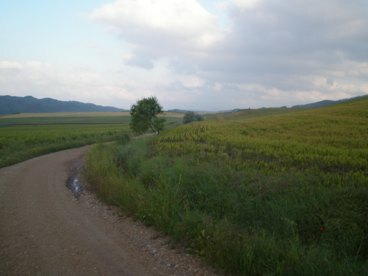 Roads, like the busy N120, have been constructed alongside the trail in a many places. After a day of noise from cars and a longing for a more peaceful track, Belorado was a safe harbor. I found this a challenging stretch mostly because my body was now in full revolt from my ever-quickening pace. I had this feeling deep in my bones that there were young people I was meant to meet up ahead, so I pushed myself to walk farther and farther each day. This had caused my achilles to bunch up like tightened rubber bands and brought on tendonitis with each step. The church in the town was covered in large nests. Beautiful long legged storks had fashioned these nests to sit atop the spires. Somehow I need to remain calm in the face of another dayâ€™s journey towards community. I ate pasta, slept, and awoke at 5 am to begin my walk in the dark. It was a Saturday. As I took off into the outskirts of town, young Spaniards were still in the streets, awake from clubbing the night before. To them I must have seemed an apparition that their addled senses could not understand. That day I walked 50km/30 miles. I hardly stopped to eat. The road just fell away before me. At midday, I saw the city that was my goal and I knew I would reach it. 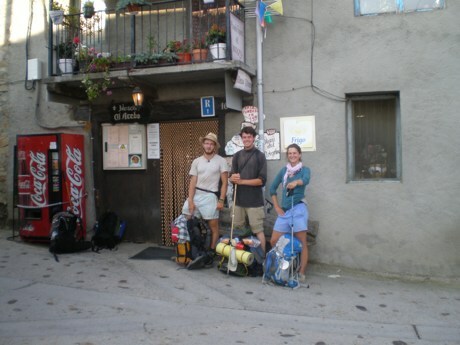 That night, I met two American guys, who were part of the group that I would travel with until the end of the trail. They later told me that I seemed positively rabid to talk to them. I was rabid, for the part of my journey without community was thankfully over. Finding the inner kindness to listen to your body with compassion. 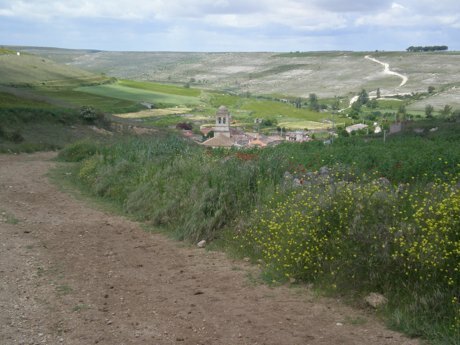 Hontanas was the first place I spent the night in the very distinctive region called the Meseta. 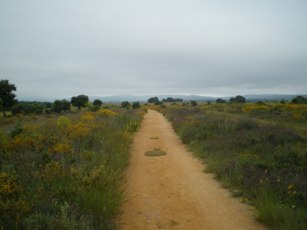 The trail runs through the Meseta for about a week and a half. 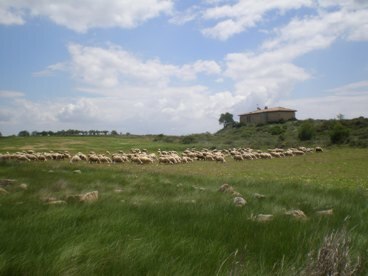 The Meseta is known to be dry, hot, treeless, and very flat. The towns are very compact in this area and sit like islands in the midst of golden heat. Of all the geography that the pilgrim encounters on the trail, this one is the most talked about. People note its intensity. Most have a strong reaction to the empty vastness one way or another. For some, it clears the mind. For others, it is endless tracks of the same as far as the eye can see. 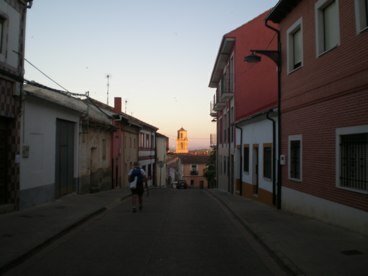 Hontanas was a town in the middle of the Meseta. For miles all that could be seen of the tiny hamlet was a church spire that look as if it were a few feet off the ground. The land was like being at sea; grass waving and the clouds reaching right to the edge of the earth. 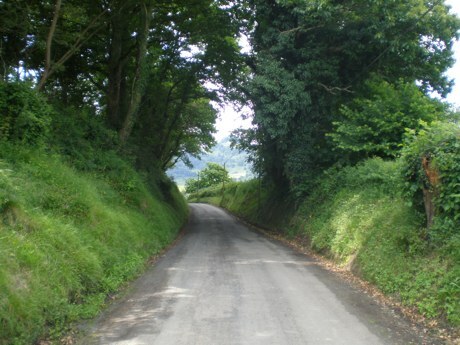 As I got closer to the town, the houses and old streets came into view down in a little valley, tucked against the edges of the only hollow for miles. This sweet and mellow town seemed unperturbed by the constant change in weather that brought blazing sun one minute and then torrential rain the next. When I stopped in Hontanas, it was clear that the pain in my legs, or my ankles to be more specific, had finally caught up with me. I arrived at midday and would have liked to press on, but my body said no. I had to trust this wisdom. In return I had a very precious talk with a woman in the albergue and met up with my new American friends again. Let me tell you, listening to my body was not an easy task, but just as Hontanas was cradled by the Earth, this point on the trail compelled me to cradle myself. The restorative work I did that night was essential for all that would come for me in the following days. Breaking down the behaviors triggered by fear that cause us to push our physical and emotional selves beyond balance. This Essence combination came from the Flowers collected around one of the more challenging moments on the trail in terms of my internal journey. I had met up the previous night with both the American boys and a much bigger group of three British guys, two British girls, two Germans, an Australian young woman, and a man from the Netherlands who had started the trail at his front door. It was suddenly a different trip, filled with laughter and companionship. But I was still a bit edgy about slowing down from my spartan pace, so the next morning I walked beyond where the group had arranged to meet for the night. I donâ€™t exactly know what possessed me to do so, but it meant that I walked in the blazing afternoon heat, ran out of water, burned my legs so badly that they bled, and generally felt physically scared for the first time. 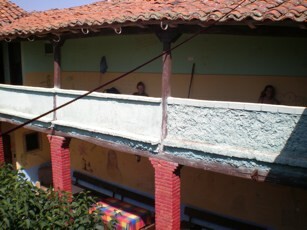 When I arrived in Sahagun, the albergue was empty. I felt bereft of my new community. I knew that I had pushed too hard and I needed to look at the personality pattern that drove me to that. 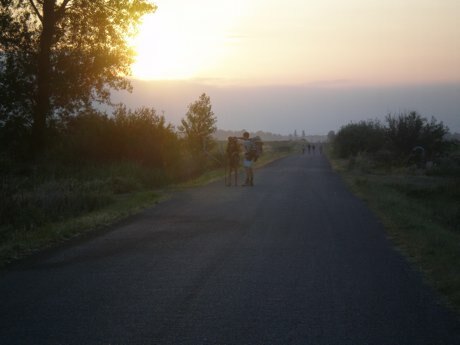 The next day, I slowed my pace dramatically and walked only a few kilometers so as to meet up with the group again. As I sat in the grass and waited for the group to catch me, I realized that I was ready to look at the pattern and let it go with kindness. I think this Essence will be helpful for any that find themselves in a similar place. Keynote: Realizing the potential to create oases of color and joy in the bleak stretches of our lives. This was one of the most lovely and eclectic places that I stayed the whole trip. The albergue was in the middle of the Meseta, but painted every bright color you could imagine. The people who ran it loved pilgrims. The front yard even had a pirate ship in it. As our group had talked about pirates frequently in our days on the trail, when we saw that ship, we knew that we had arrived in a truly magical place. We slept outside on mattresses tucked up alongside each other, and giggled as the sun went down. The town was in a minor draught and the water supply was turned off every day at midday. Somehow, this lack of necessities did not diminish our lovely evening one bit. I felt truly grateful for the gifts that Mazarife gave all of us. Helps us to practice the art of containing other peopleâ€™s stories with compassion and clarity. The day that we walked through Rabanal was one of earthen tracks and deep conversations. One of the gifts of the trail is that you never know with whom you will walk and how that conversation will change your relationship or even your sense of yourself. On this day, I walked with my friend from the Netherlands who had already been walking for over three months when he joined our group. We talked of his life and he told me of his experiences with the death of his father when he was a young boy. After that morning, he and I had many nice moments of pure silliness. One was eating the best chocolate pie I have ever tasted during our afternoon in Santiago. Much of this was due to the fact that we had gone deep that morning. The trail had helped me to see and hear him as we walked and talked. In my experience of life, the gifts of a listener who can contain your story and stay connected to you after the telling is done, are the most precious gifts we can give each other. This essence is there to support us in this. Finding the ability to look below the surface of a situation and feel into its energetic core. To break down the external worldview and be energetically discerning about what are true gifts and what are red herrings. This was another magical night on the trail. As a group we decided that we wanted to experience an albergue that was a bit off the normal route that most pilgrims take. We aimed our dayâ€™s walking to arrive at a small albergue in an abandoned village high in the mountains, one that had been deserted for over fifty years. Some were a bit nervous about the reports of no running water, no bathrooms, and very rustic sleeping accommodations, but the consensus was that it was too much of an adventure to pass up. When we arrived at the ramshackle buildings, they were colorful and cluttered. Kittens ran around our ankles. It was a place of life among the ruins of the village. We slept in a converted barn. Our generous hosts served us one of the most delicious meals of the trip. We bathed in the well down the road, and sat around the outdoor table until the sun went down. Our hosts were Knights Templar, members of an ancient fraternity who have supported and protected pilgrims since the Middle Ages. In ancient times, they looked after the pilgrimâ€™s money so that it was not stolen while they walked the trail unarmed and defenseless. Here in the small deserted town, hundreds of years later, this small band of men, some elderly like the head of the albergue, who sat at the top of the table and told us of the history of this town, and others, like his son who was busy cooking our supper, gave us all gifts that we had to look below the surface to truly see.